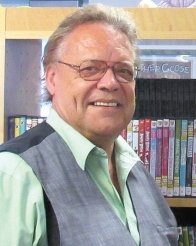 The Fort Myers Beach Library family is mourning the loss of their beloved director, Dr. Leroy Hommerding. Dr. Hommerding was fatally stabbed by a vagrant shortly after opening the library doors to welcome people who were waiting to attend the library’s book sale. Dr. Hommerding was hired as the library director in 2000. During his tenure, he oversaw the building of our state of the art library. He made certain the design included the most current environmentally sound building practices. The library’s heating and cooling system is fueled by solar power. Rainwater is use in the plumbing system. Much of the architectural design includes, subtle references to the beach environment. For example, there are waves on the ceiling and canoe bookshelves. The children’s area has a tree and ceiling tiles with whimsical toy representations. Dr. Hommerding understood that many of our patrons are on vacation when they visit our town. He made sure that our collection included reading and audio video materials that would appeal to visitors. Recognizing that our town includes many retirees, he included in our collection the largest selection of large print books in the state. Our director also wanted people to view the library as fun, educational and welcoming. He collected unique bookends for the library shelves. Usually the bookends tied in with the books on that particular shelf. He put flowers and beach related items on display on top of the bookshelves. Puzzles for patrons and visitors to piece together are always out on a large table on the second floor. Our monthly event calendar includes daily classes, weekly movies and monthly book discussions. Dr. Hommerding wrote a weekly column for two of our island newspapers informing readers of library events and new library acquisitions. He also served on the Board of the Friends of the Library and was instrumental in growing its membership. Dr. Hommerding was also very active in our community. He was Treasurer of the Estero Island Historic Society. Most recently, he successfully submitted a grant to the Florida Humanities Council. The Historic Society was awarded enough money to fund a speakers’ series for the community. He was an enthusiastic and regular volunteer at the Kiwanis’s Thrift store. In the past, he served on the Board of Directors for the Mound House. Dr. Hommerding is survived by seven brothers and sisters. They are Joyce (Ken) Bertram, Roger (Terri) Hommerding, Janet (Mark) Eisenschenk, Doris Hommerding, Linda (Mark) Donnay, Vernon (Cathy) Hommerding, Laura (Leonard) Nordmann, twenty-two nieces and newphews and his colleague and friend, Cletus Poser. He was predeceased by his parents, Ervin and Lonie Hommerding. A Memorial Service is planned for Saturday, January 26, 2019 at 1 PM in the Library garage. Memorials may be made to the Fort Myers Beach Library.